When you consider that your tyres are the only point of contact your vehicle has with the road, you can appreciate why it is vitally important to not only have the right tyres, but that they are also kept in good condition and inflated correctly. Even the most advanced traction control, skid prevention and anti-lock braking systems cannot compensate for worn, wrong specification or incorrectly inflated tyres. There are many different reasons for tyre wear. 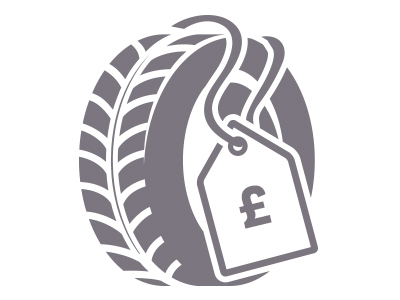 Tyres don’t just get worn through age and use, but also through emergency braking, under-inflation or over-inflation, and if the wheels are misaligned which can mean that one edge of the tyre wears more rapidly than the other. There are three main causes of tyre problems speeding and overloading. Small changes in driving style can make a big difference to maintaining your tyres and of course to your fuel consumption. Driving at speed, rapid acceleration and fast cornering will create a greater build-up of heat within the tyre which in turn can cause tyre damage. Also, emergency or harsh braking can sometimes leave your tyres with premature tyre removal. It is always recommended to have your tyres checked if the vehicle has been involved in an emergency manoeuvre like sudden and heavy braking. Economy: Over or under-inflated tyres suffer more damage than those with the correct pressure and need to be replaced more regularly. Vehicles with under-inflated tyres have increased rolling resistance which requires more fuel to maintain the same speed. Nearly all tyres have a 'tread wear indicator' which is a ridge of rubber set at 1.6mm, in the base of the main grooves. When the surrounding tread wears down to this level, the tyre must be replaced. Typically, a brand new tyre will have a tread depth of 8mm. In wet conditions, road grip and braking efficiency progressively reduce with tyre wear. Stopping distances are longer, particularly as the tyre enters the second hal of its life. 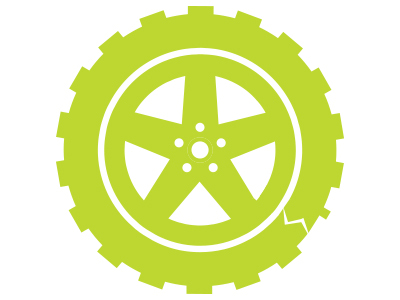 Irregular wear on a tyre is usually caused by a mechanical defect on the vehicle. Any significant difference in wear rate across the width of the thread, or around the tyres circumference, can mean worn or misaligned wheels/axles. Check tyres regularly for visible signs of damage and foreign bodies such as stones, screws and nails, which can become embedded in the tyre. If left in the tyre, the ogject is likely to cause further damage, possibly rendering the tyre unfit for repair and in certain cases causing tyre failure. 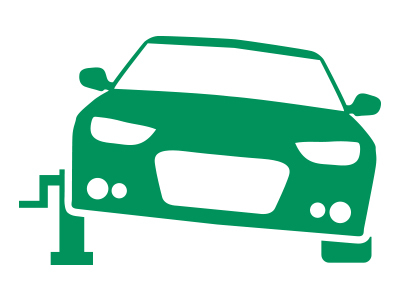 Other than uneven wear, the next most frequent cause of premature tyre replacement is damage caused by impacting a solid obejct, for example a kerb or pothole. The most common first visible symptom of such damage is a bulge on the tyre sidewall; this is a clear indication that the tyre's internal structure has been damaged. Often neglected is the ‘spare’ tyre. It is important to keep this correctly inflated as it cannot be anticipated when it will be needed. 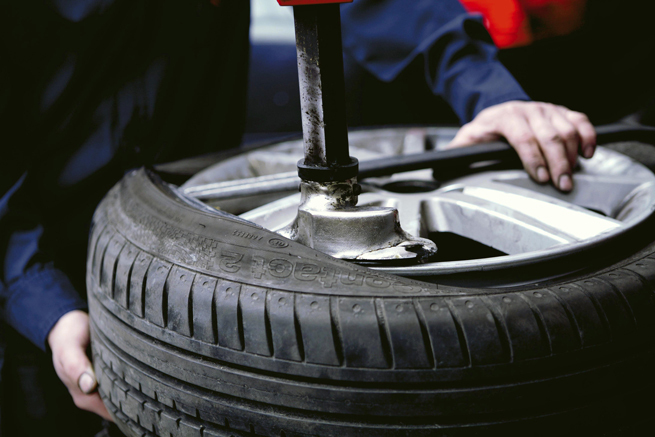 This means that it is vital to check your spare tyre as often as those in day-to-day use. You should also familiarise yourself with the location of the car jack, the spare tyre and the locking wheel nut tool before you need to use them in a real situation. Spare tyres can be full-size or temporary space saver tyres. Space saver tyres are designed to take up less room in your vehicle and to get you home, but not to be driven on for long periods. Many of the space savers cannot be used at speeds over 50mph so refer to your handbook for further guidance. 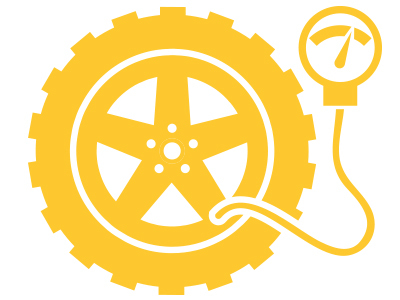 Mobility kits can range from a can of Tyre Puncture Sealant on its own or in combination with an electric compressor. 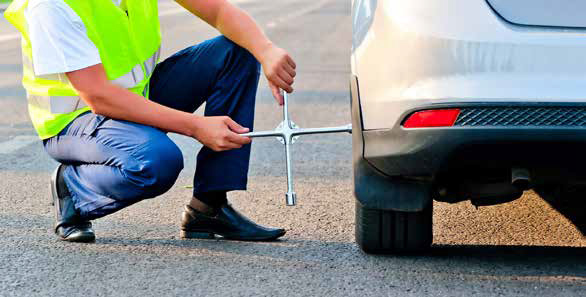 Such devices are intended as ‘get you home’ measures for small punctures only and allow the vehicle to be driven home, or to a tyre dealer, where the damaged tyre can be properly inspected to check its suitability for a permanent repair. Having a puncture in one of your tyres can also be a moment of great distress and/or inconvenience. Being prepared by reading the instructions in advance will ensure you are in control in such an event. Tyres play a crucial role in ensuring the safety of all road users so any issue is best dealt with by the experts; it is important to have all the details to hand should the need arise. Always use roadside recovery services when tyres are more seriously damaged since this may also be indicative of a more severe impact on the wheel, and of additional damage to the vehicle beyond a simple puncture. Also to keep you safe we recommend you always call out a breakdown company, if you need to change a tyre on the roadside. They have better equipment, flashing lights and high vis, which minimises the risk to you and your passengers. Having correctly inflated spare tyre or a complete and intact mobility kit at the time when you most need them is crucial. As with any unforeseen incident, it is important to carry emergency essentials at all times in your vehicle; these typically include a torch, mobile phone, high visibility jacket and a warning triangle.